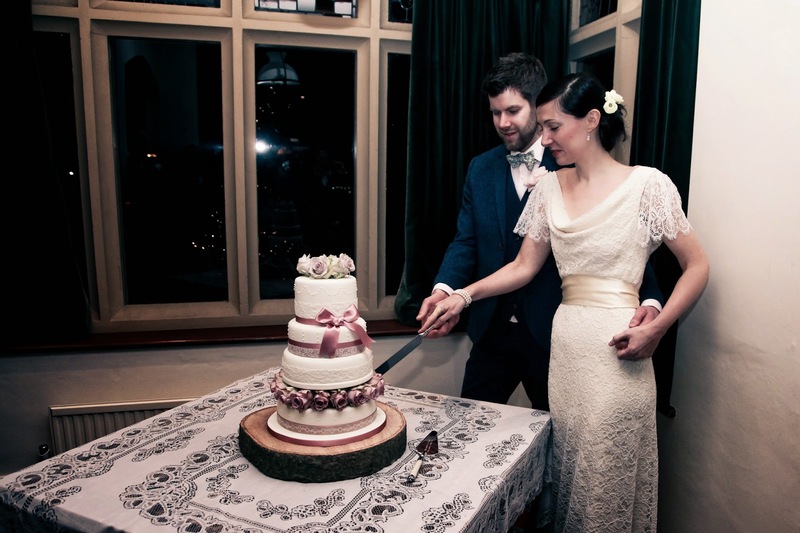 Between Christmas and New Year I had the honour making a wedding cake for my tap dancing teacher. Alex has been teaching my daughter tap for a couple of years and she now has the dubious pleasure of teaching me as well. Generally speaking I don’t ‘do’ wedding cakes, as I find it all rather stressful. The pressure of getting the cake absolutely perfectly right is magnified when the occasion is a wedding. I find this (and also some brides to be!) a little scary, however I couldn’t possibly say no to the lovely Miss Alex, especially as she was planning a vintage theme for her wedding. I met with Alex and Kevin a couple of times and between us we came up with a simple but elegant design, using lace from Alex’s dress and some pretty vintage lace that I found at a fair. 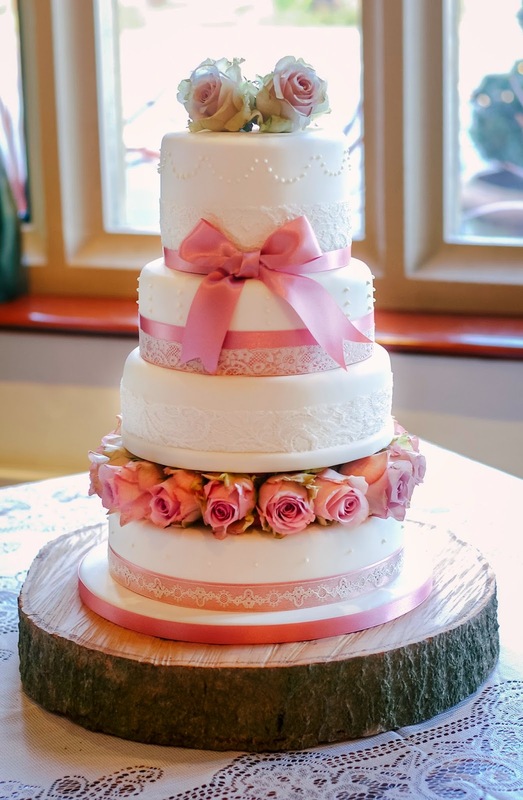 There were four tiers, each a different flavour, decorated with piped royal icing, a dusky pink ribbon and fresh flowers to match Alex’s bouquet. We had decided to have a layer of fresh flowers between cake tiers, which meant that I had to do some research as this was a new skill for me to learn. Luckily Jen from Jen’s Cakery was kind enough to give me some advice on this, and I am very grateful to her. Jen lives near me and makes stunning wedding cakes, so she was the perfect person to consult. 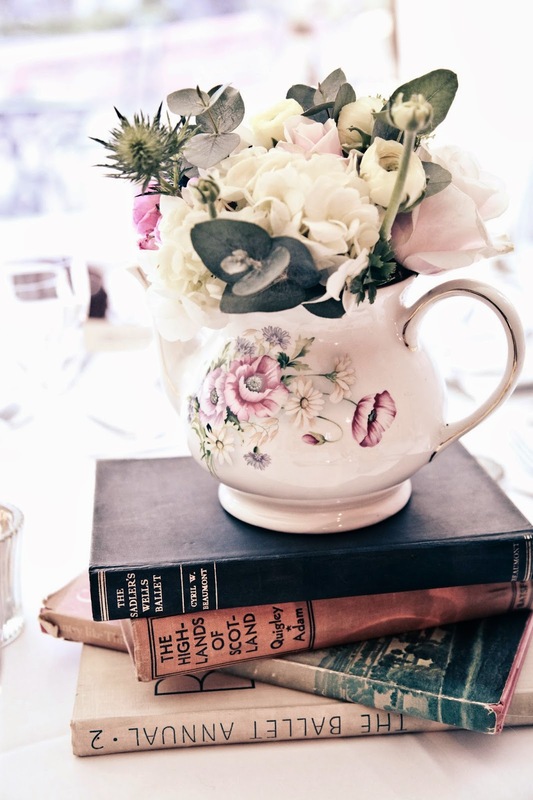 The wedding was beautifully styled with lots of little vintage touches. I love the stack of books on the middle of each table, carefully chosen to suit the guests seated there. I have already asked to borrow a couple of things for a tea party photo shoot!